Just thinking about the size of the IBN 5100 makes it obvious it won't fit in the regular sized lockers. 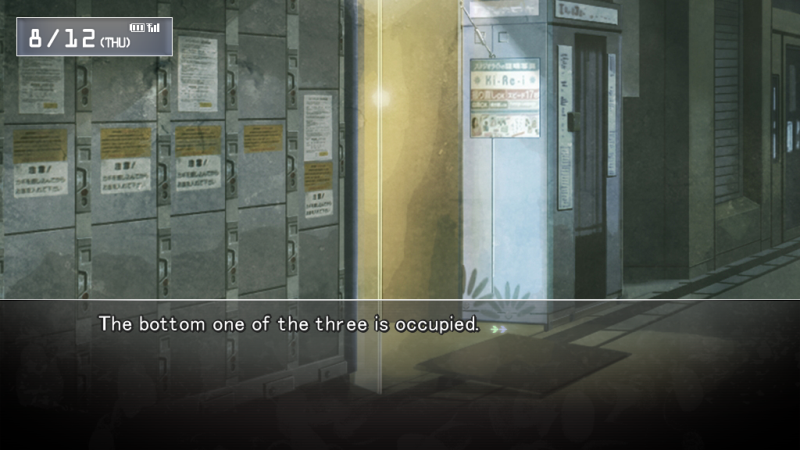 Basically, that means it could only be in one of the three larger lockers on the right. Is the IBN 5100 in here...? Of course, I'm excited. I've become far apart from you, my destined partner. You've returned, separated by nothing but a thin locker door. Is this... what love feels like? To hold back the rising tension, I think. Is the IBN 5100 really what's inside? I want to confirm that. 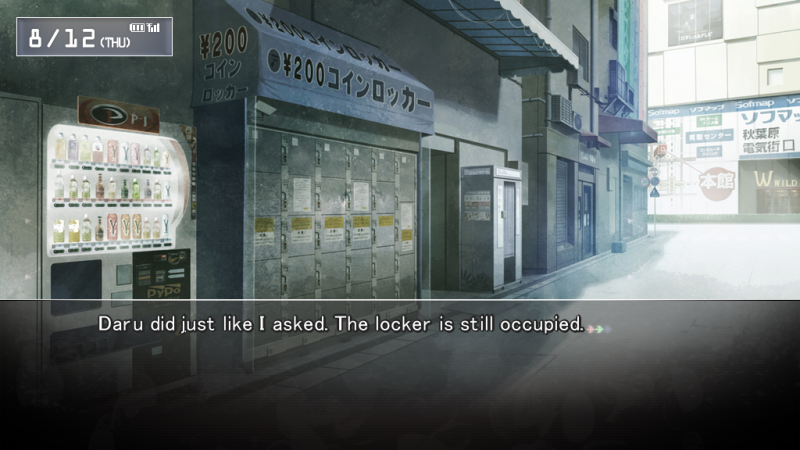 I'm glad I got Moeka to tell me she placed the IBN 5100 somewhere in this locker beforehand. How about I try breaking the bar thingy on the locker door? If the IBN 5100 is inside as expected, and I steal it, what would happen to the world line? I mean, I can cancel the changes to the past with a D-mail. I think doing that is a necessary rite to return to the original world line. But now that the IBN 5100 is this close, it feels like obtaining it's just too easy. 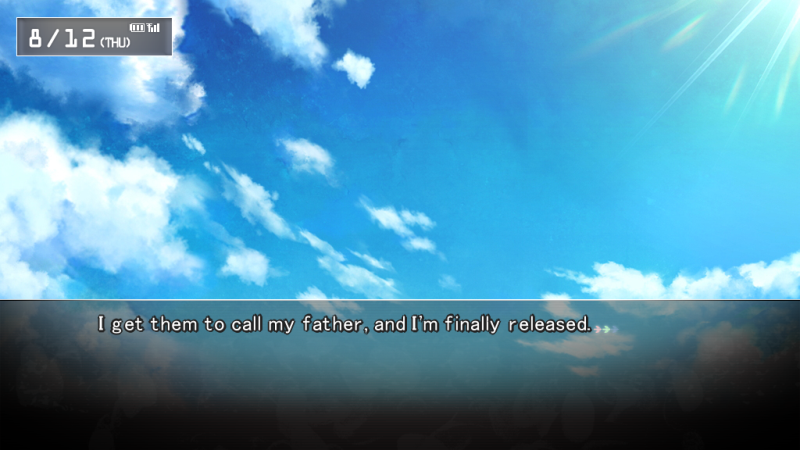 My decision to cancel Moeka's D-mail hasn't changed, but this method's already right before me. Let's try it, just to make sure. When I come to the coin locker again and try to wrench it open, another patrol car appears, this time to take me to the police station. I'm stuck all night getting preached to in the investigation room. This is also the result of attractor field convergence. No matter what I do or how I do it, the world's really set on me not getting that IBN 5100. They didn't go so far as to arrest me, but the police, and my father, scolded me with a harsh tone. I admirably apologize on the outside. I call her - I took the chance to memorize her phone number yesterday - but she won't pick up at all. I sent a mail to Daru, asking him to check if the coin locker was still occupied. "You put the IBN 5100 in the bottom right coin locker, am I right?" "There were only three lockers there big enough to fit an IBN 5100, and only the bottom one was in use. If you put it in the bottom one, then that means that FB still hasn't picked up the IBN 5100. You know what that means?" "You hadn't thought about that? You're a Rounder, yet you lack composure. I'm gonna try to keep a lookout. You?" "...If you meet... what'll you do?" 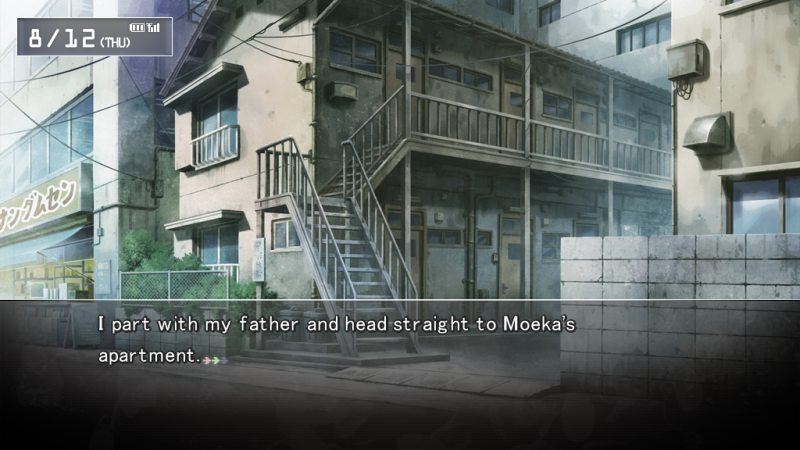 That's the best way to prevent Moeka from going to Yanagibayashi Shrine. "...I won't meet her. I'm not brave enough to meet her... I'll be disillusioned..."
"Weren't you disillusioned long ago? You were never given any expectations from the start." Moeka's face warps again. My sage of only blunt words was not only because Moeka killed Mayuri, but also because I was getting irritated at Moeka's weakness. I look around and check to make sure there are no patrol cars. This time I won't wrench it open. They'll definitely arrest me for a third offense. 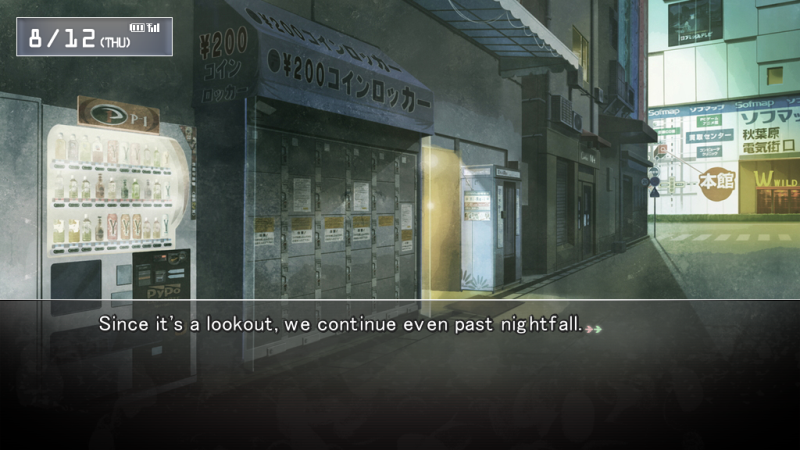 I hide behind one of Daibiru's humongous pillars across the street, and begin the outlook. 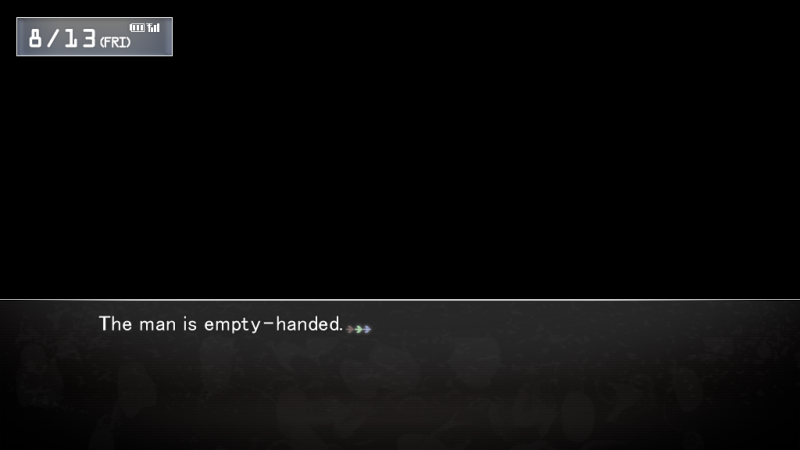 I thought of borrowing a handheld game from Mayuri, but there's no point in observation if I'm goig to distract myself. But, just standing is suffering, and I need to make sure I'm not conspicuous. If I keep standing in the same place, I might get noticed by surrounding eyes. I'm scared that a security guard might come and scold me. Somebody taps on my shoulder. FB?! I almost jump in a panic, but my legs feel like they're twisted and can't move. 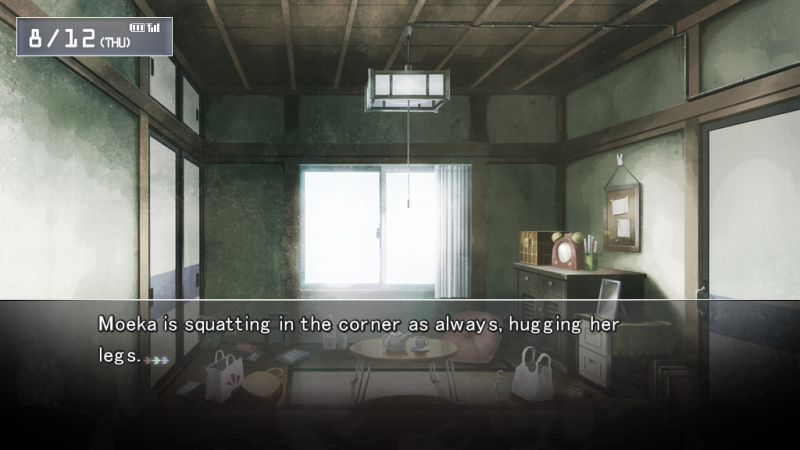 Moeka hugs her knees and looks at me with cold eyes. "...I'll keep a lookout too. Can I...?" "...Why'd you change your mind?" I stand up and dust off my clothes. "You were comfortable with your mail-only relationship with FB. You used to be dependent on that moderate distance. So why did you plan to step forward now of all times?" Moeka puts her head on her knees, with a face still about to cry. I've seen that expression once before, lit by the moon in that apartment. 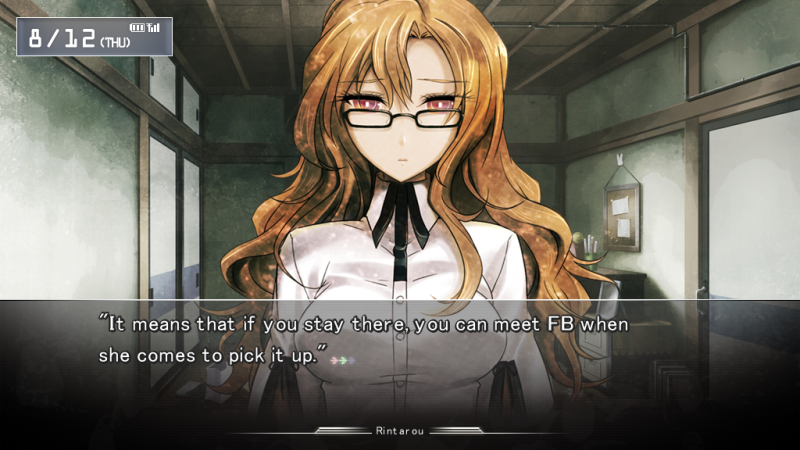 "...if FB still won't contact me... my connection to the world..."
"It'll be broken off, huh." "You're just a typical cultist." And FB abused this woman's weakness, and finally threw her out like tattered clothes... How frustrating. FB's vileness. Moeka's weakness. Then, Moeka nervously presents a convenience store bag. This stuff is perfect for keeping a lookout. There's enough for two. "So, do you want to join?" "Alright, permission granted. Help me keep a lookout." With two of us, we can take turns watching. It also makes us look less suspicious to people passing by. We nap in one hour shifts, but I'm still tired and drowsy. On top of that, I don't have someone to talk to - Moeka can't keep a conversation - so I can't do anything to stave off boredom. In the morning, before the sun rose, I went back to the lab to shower, but Kurisu, who was working an all-nighter on the Time Leap Machine improvements, looked at me coldly. Someone appears and opens the lower right locker - the locker with the IBN 5100 in it. We immediately move to where we can't be found and peek at the situation. The person is a lackluster middle-aged man. He's wearing a new suit, but it seems awfully unnatural. It doesn't look like he's used to wearing it at all. Moeka strongly shakes her head. "So... maybe it's someone hired to pick it up." Or could it be the locker's management company, here to retrieve it after its extended neglect. In that case, FB, Moeka and I are all terribly stupid. The man has the locker's key. After paying all of the additional fees, he takes the cardboard box with the IBN 5100 out of the locker. Thinking ahead, the man brought a push cart. After a bit of effort, he puts the IBN 5100 onto the push cart and begins walking. 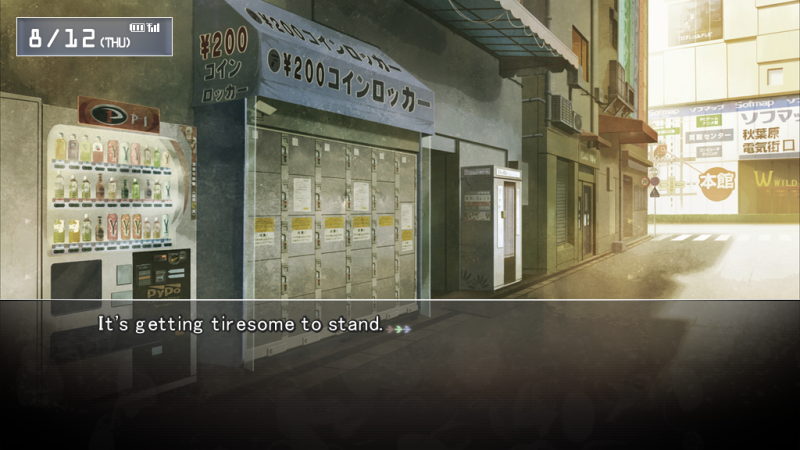 Strangely, he calls out to a plump man standing in front of the ticket machine. 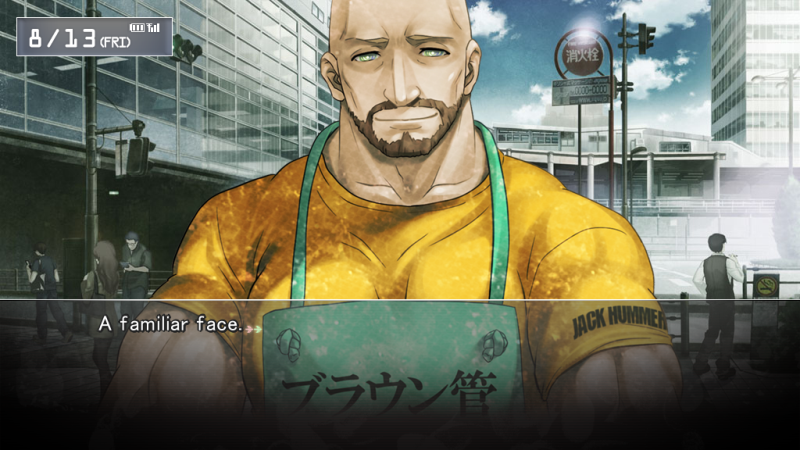 The plump man, wearing a T-shirt, really looks like an otaku. He doesn't seem to have anything in common with the suited guy. They transfer the IBN 5100's cardboard box onto the plump man's carry-on cart. They exchange a few words, and the plump man enters the station alone while the suited guy sees him off. Is there a point to this transfer? Is the plump man FB? The collector handed it off to the deliveryman? At any rate, if we keep chasing the IBN 5100, we'll eventually reach FB. Believing thus, we enter the station. Not in the same car, but watching from the next one. It's a weekday afternoon, so there aren't many passengers. We don't see the man move for about 30 minutes. We arrive at Shinjuku Station. The number of passengers getting on and off instantly multiplies. Moeka mutters so while pulling my sleeve. When I look, the plump man has slipped into the stream of departing passengers, and has gone through the door and onto the platform. After getting delayed pushing through the stream of boarding passengers, we get down to the platform. THe man is leisurely walking on the platform. The train closes its doors and slowly departs. 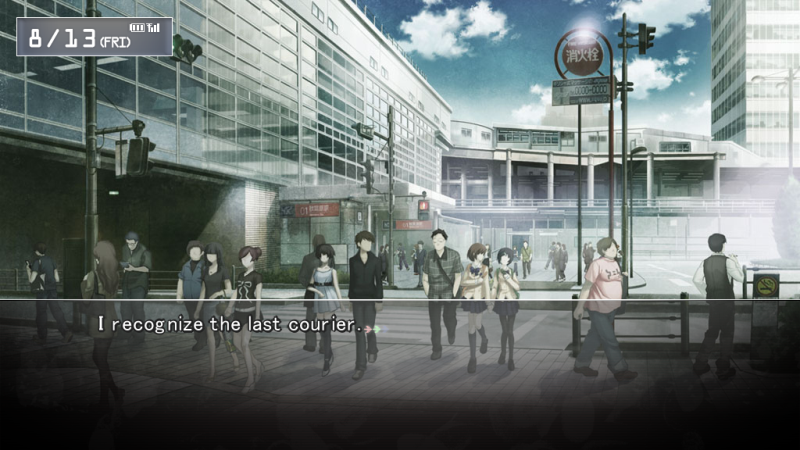 There truly are a lot of people in Shinjuku. We close the distance and follow the man from right behind so we don't lose him. Then, we're surprised. The carry-on cart is missing. Eh?! I thought we might have mistaken our man, but that's not it. we saw him standing still on the train. He definitely got off the train onto the platform here. I'm certain he had the carry-on cart when the train arrived at Shinjuku. So does that mean that he handed it off to someone in the chaos of boarding and departing people? Now I notice what happened on the train. It's bad manners to take out your phone inside the train, but I have no choice in this emergency. 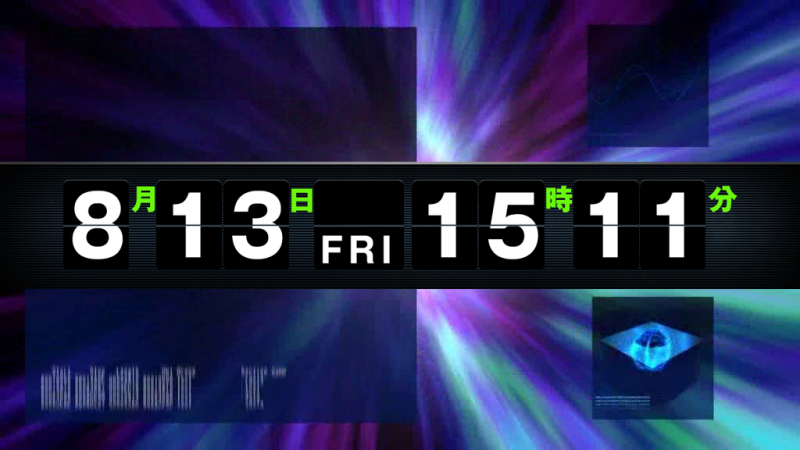 Looking at the train's display, it was right about when it left Otsuka, heading towards Ikebukuro. Moeka is next to me, hiding her breath. We peek into the next car, where the plump man stands. "It starts at Shinjuku. That guy's gonna get off, but he actually delivers the package to someone else. He got us good back then." It looks like Moeka doesn't fully understand yet. 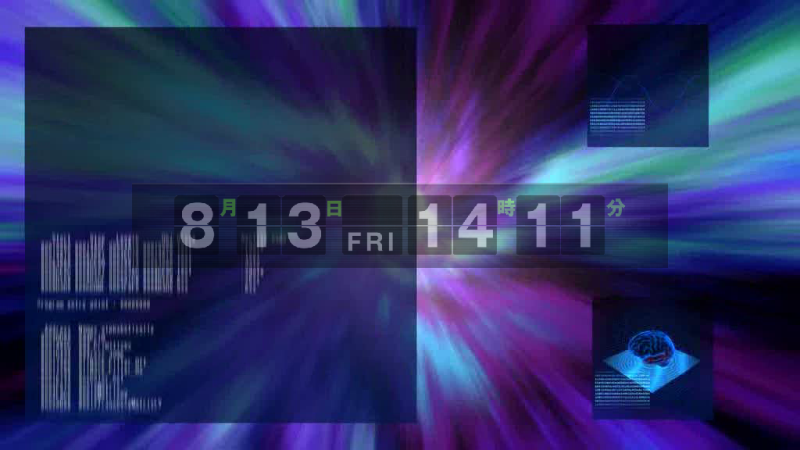 "I time leaped from one hour from now." Moeka's eyes widen. 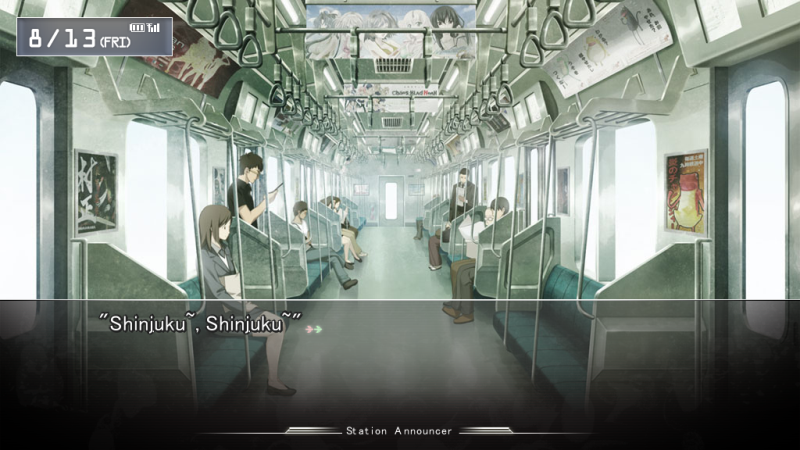 The train arrives at Shinjuku Station on schedule. Just to make sure, I'll have Moeka get off at this station and follow the plump man. I sneak over to the same car as him. He still has the carry-on cart with the IBN 5100. And now passengers come in from Shinjuku. Inside, the one who walks up to the abandoned carry-on cart is a woman in her 30's pushing a baby stroller, but there is no baby. The woman puts the carry-on cart onto the baby stroller as if it were natural. After seeing that with my own eyes, I return to the neighboring car. We have to follow carefully. This attention to detail isn't normal. The train starts moving. I contact Moeka so we can regroup later. Yamate Line, Meguro Station. Nanboku Line, Nagata-cho Station. Yuraki-cho Line, Ikebukuro Station. Fukutoshin Line, Shinjuku Sanchome Station. Toei Shinjuku Line, Kudanshita. Tozai Line Kayabacho Station. Whenever they gave me the slip, I would time leap and resume the chase. 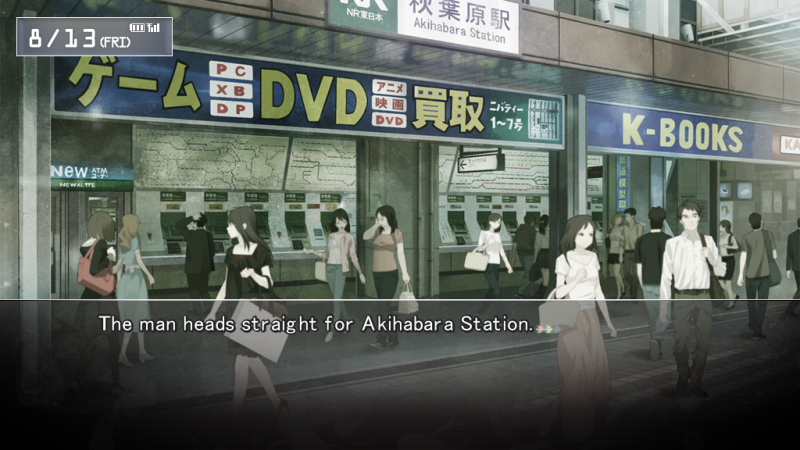 Finally, the courier and goods got aboard the Hibiya Line, and after so many twists and turns, they unexpectedly returned to Akihabara Station. He's one of the men involved with Moeka's attack on the lab. Dark skin and a crew cut. The one who first struck me with his gun. The man easily carries the 25 kilo package out of the station and... a car honks its horn. 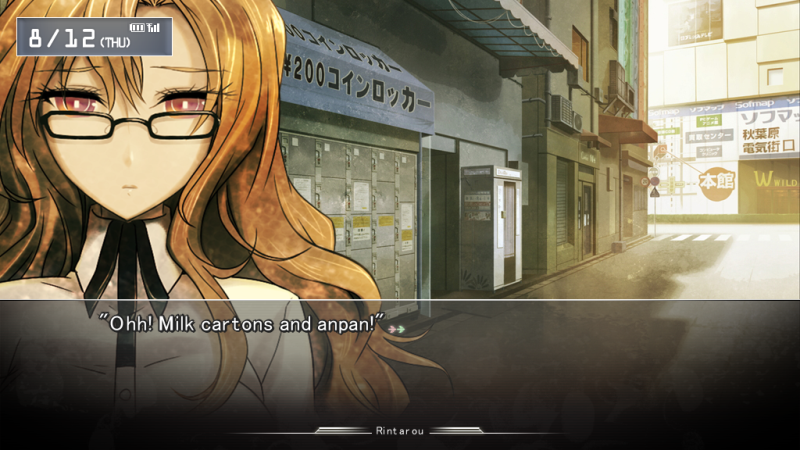 Moeka and I immediately hide and peek at the situation. A white station wagon parks in the roundabout in front of the station.